Classic lines from a classic movie. This movie - a summer blockbuster in 1975 traumatized a lot of people. I am an 80's baby and a 90's kid. So, I watched this movie much much later but was extremely terrified non the less. Now, back to my outfit today. 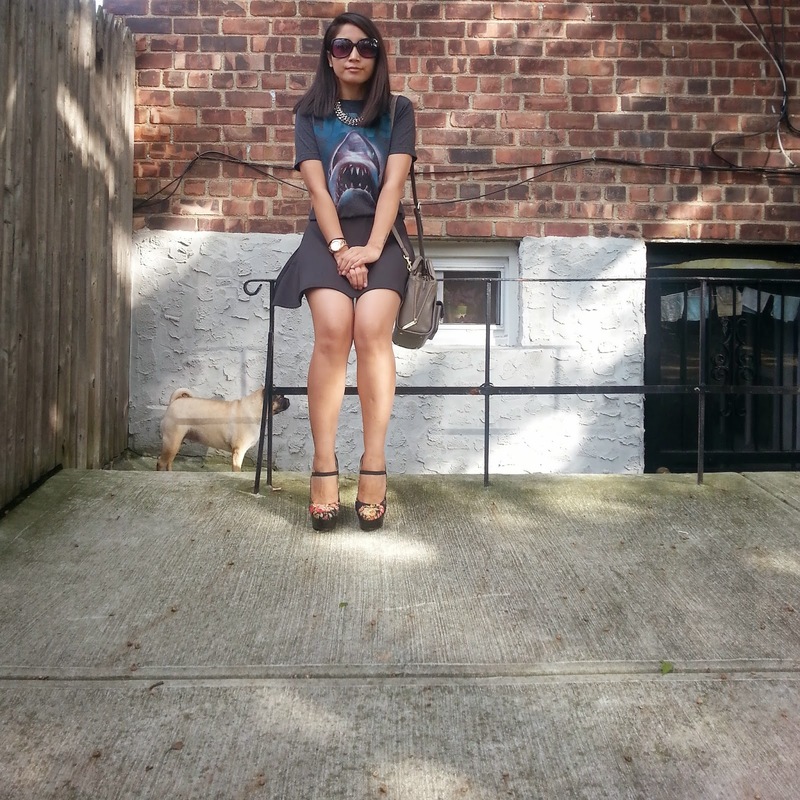 I paired my JAWS t-shirt with a black circle skirt. Added floral platforms, a shiny necklace and a tiny crossbody bag. P.S. If you haven't watched JAWS yet I would suggest you go watch it NOW. Lovely top and the necklace is amazing! So cute! I love your bag and shoes! If you have chance I'd love for you to stop by my blog! Thank you! Hi dear i realy love you outfits, are very special and i remember this movie in my childhood, love the shirt. Kisses and i invited to follow me. 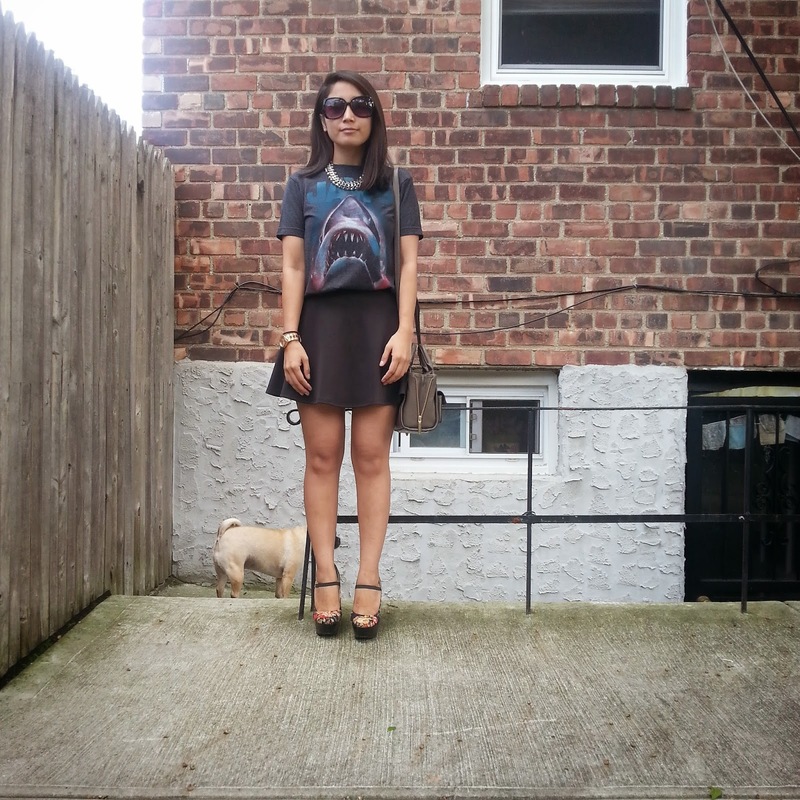 The outfit is really cool with the shark T! 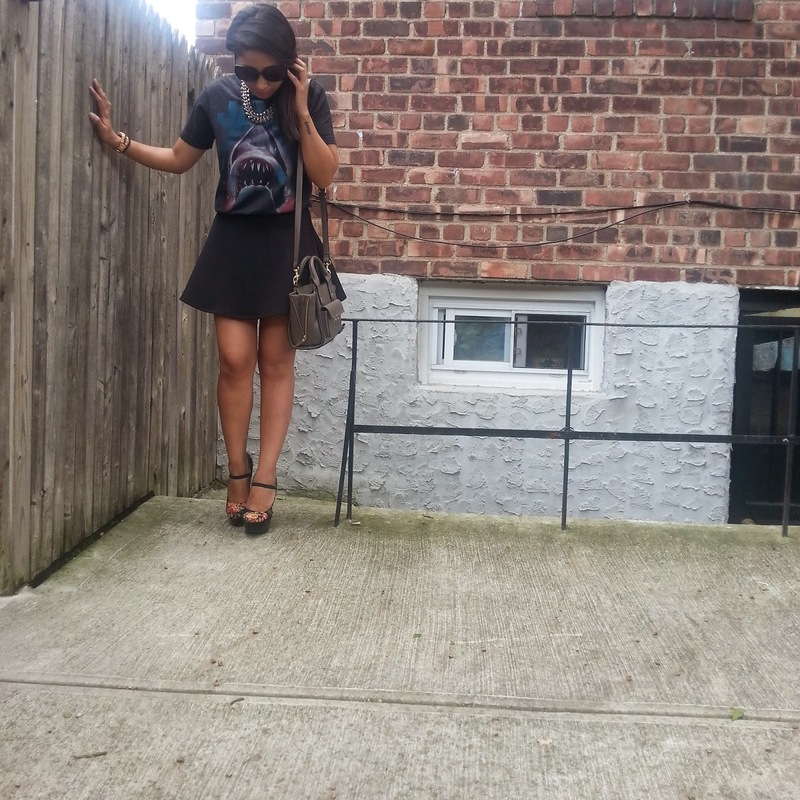 Really love the shark tee and how you match it with the floral heels, interesting! Great pics! Looks like your pup wants to model too! Pretty bag and shoes! love your pumps, you look pretty !! I LOVE YOUR HEELS! so beautyful! hihi your doggie always in your pics,love it !! OMG, this bag is just A M A Z I N G ! I totally love the top!!! I'm an 80s baby and 90s kid too! Some of best decades right there. I so miss those times. Wish I could just be a kid again!! Love this jaws inspired outfit! Really cool Vikee! Omg your outfit is perfect! love everything you have on!!! I love so much your t-shirt!!! And your bag??? Is very wonderfull!!! Thank you for visiting my blog! Do you want to see my last post? What a cool look! I love a cool tee! Would you like to follow each other on GFC?! Let me know and follow me on my blog, I will follow you right back on both GFC and Bloglovin! First time on your blog and I must say you ve got an amazing blog. Your dog is cute. That cross body bag is super cute, nice find. You look chic, the outfit turned out girly and edgy at the same time. Besides, those snapshots are so lovely! I like the skirt and the cute pet in the photos. I love the aviators style!!! Thank you for visiting my blog! Do you want to see my last post? 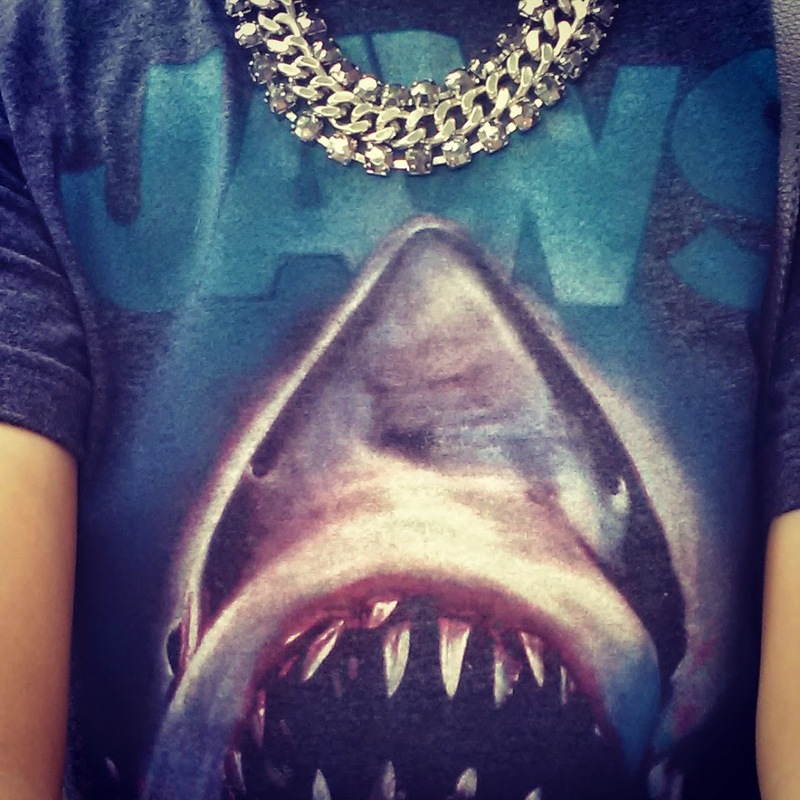 Awesome shark shirt <3 I really love it!